Some recently announced events that will take place in December. 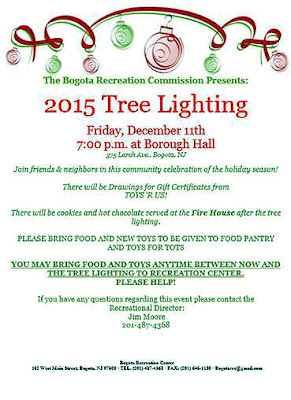 The Bogota Recreation Commision has announced the Friday-11-December will be the date of the annual tree lighting in front of Borough Hall. This is scheduled to start at 7:00p and be in front of Borough Hall located at 375 Larch Ave. Bogota, NJ. 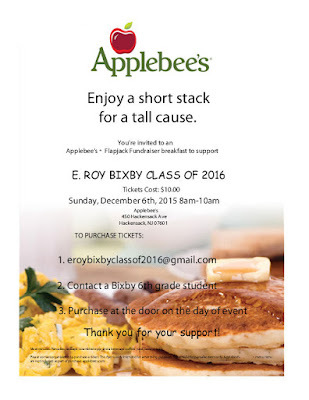 Carolers will be present to sing songs, and a special guest to help light the tree. Afterwards there will cookies and hot chocolate served in the W. Broad St. Fire House. It is asked that anyone attending to bring non-perishable food items which will be donated to local food banks. Also donation of new , unwrapped toys will be accepted to be given to " Toys for Tots" Items for donation may be delivered to the Recreation Center starting this weekend up until Friday 11- December.